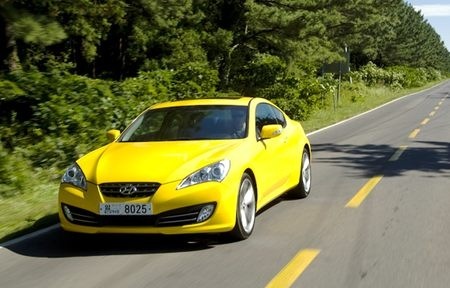 Hyundai Genesis Coupe has a great 310-hp, 3.8-liter V6 engine with a 6-speed automatic gearbox that can run from 0 to 62 in only 5.9-seconds. Hyundai Genesis Coupe 2 plus 2 seats will be launched in 2009 Spring, in America and will be offered with a V6 of 3.8 liters that will develop over 300 HP. Equipped with a manual gearbox with six steps and transmission on the rear deck, 4,666 mm long car will accelerate to 100 km per hour in less than 6 seconds.